Flood water is highly contaminated. It poses risk of outburst of diseases. Food and drinking water can become scarce. Medical emergency hardly gets handled. Floods are the most common peril to cause disasters on human life and lead to extensive morbidity and mortality throughout the world. However, the impact of floods on the human community is directly related to the location and topography of the area, as well as human demographics and characteristics of the environment. 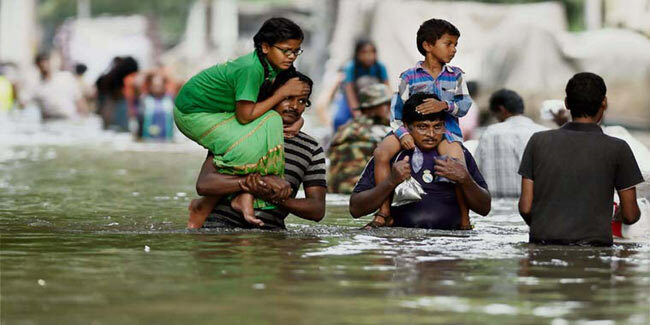 If you have been following news headlines lately you know what Chennai has been going through. The heavy rains broke century old records with daily rainfall as high as normal monthly rain. The alarmingly heavy rainfall flooded the city with water, leaving almost everyone struggling for survival. Floodwater can be dangerously fast-flowing and is likely to be infected with bugs. So, anything that comes in contact with it is actually at risk of injury and disease. Here is what you can try to stay safe and avoid falling prey to unfortunate floods. The most immediate health risk floods put you at is drowning, especially, if the water is fast-flowing. The main reason behind it being that it is hard to estimate the actual power and force of the water. You could drown while walking, driving or cycling. Just six inches of water level is enough to knock you down, making it difficult for you to stand up again. According to a research, one third of flood-related deaths occur due to drowning in a vehicle. The research suggests that only 2 feet of standing water can float your car and fast moving water is enough to sweep it away. Don't plan to swim through the growing floodwater, you just can't beat it. It will sweep you away or do severe physical damage. Same applies to driving unless you have a car that can switch to floating mode when in water. Keep yourself away from both flowing and logged water and maintain higher altitude. Sewage easily seeks entry into flooded homes posing risk of outbreak of infections. Never undermine the fact that flood water is contaminated with everything that came in its way. Avoid foods that may have been contaminated by flood water. Even if you have no drinkable water available, avoid drinking floodwater and if you aren't left with any other choice, filter and boil it properly. Floods can really put a halt on your normal life. However, something like this just cannot be stopped. So, it is best to stay guarded.